Celebrations were held in Ottawa and Winnipeg Canada this week to introduce the new 1916-2016 Women’s Right to Vote $1 circulation coin. The ceremonies commemorated the 100th anniversary of Canadian Women’s Right to Vote and served as the official launch for coins emblematic of the suffrage movement. A special pack containing five of the coins, available at their legal tender face value, was also unveiled. 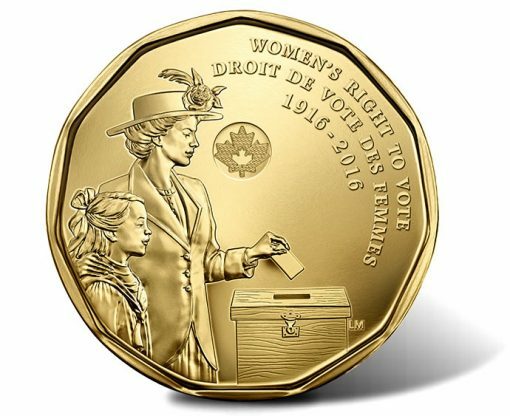 "As Canada joins the world today in celebrating International Women’s Day, the Government of Canada is delighted that the Mint has commemorated a milestone in the history of Canadian women with a special one-dollar coin recognizing the 100th anniversary of women’s right to vote," said the Honourable Bill Morneau, Minister of Finance. "Canadians from coast to coast to coast should look for this coin and collect it as a reminder that equality endures as a fundamental value of Canadian society." In 1916, Manitoba, Saskatchewan and Alberta granted most women the right to vote in provincial elections. This started the decades long movement in Canada which would eventually lead to universal suffrage in the nation. 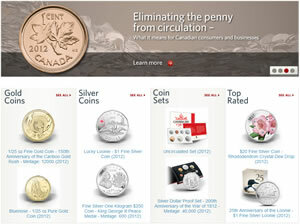 Canadian residents can order this pack of five $1 coins for $5. The Mint does not charge tax and ships the pack free. Seen on the reverse (tails side) of the new release is a design depicting a 1916-era woman casting a ballot as her daughter, who represents the future, looks on. Canadian artist Laurie McGaw created the image which also includes the inscriptions of "WOMEN’S RIGHT TO VOTE", "DROIT DE VOTE DES FEMMES" and "1916-2016." Five million of the coins will be released into circulation. "The Mint is proud to issue a new one-dollar circulation coin which shares the story of the 100th anniversary of a moment which forever changed voting rights for Canadian women," said Sandra Hanington, President and CEO of the Royal Canadian Mint. "It is especially fitting that this coin was produced in Winnipeg, in the province where women first won the right to vote in 1916." 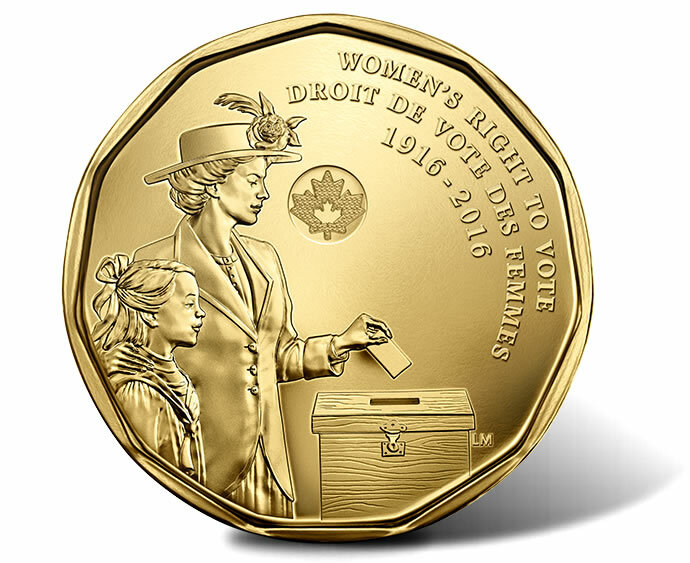 A five-coin pack of 1916-2016 Women’s Right to Vote $1 coins are sold by the Royal Canadian Mint on this page. 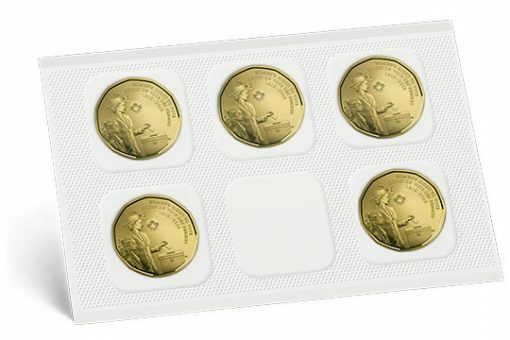 Available to Canadian addresses only, the coin pack is sold at the legal tender face value of $5 (five $1 coins) with free shipping and no tax. Limits include one per household and one per order. 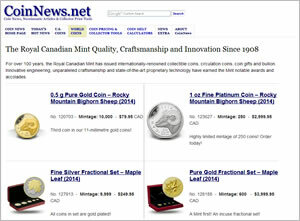 The RCM sent me details of this circulation $1 coin awhile back by e-mail as a Mint Master’s Club member. Since I live in the USA, I had a non-collector friend in Toronto order a set for me & can’t wait to see them. It is a very high mintage as a circulating coin, of course, but a great historic design! I hope the U.S. Congress passes a bill to celebrate women’s suffrage 100th anniversary on a commemorative coin in 2019 or 2020. Hint, Hint!